"You have to be brave to be an artist...It takes a fearless knight to imagine something and then let it out into the world. You never know what might happen to it. You never know what you might discover. Don't be scared. Go make something new." Imagination is a wonderful thing, right? But what happens when you imagination takes on a life of its own? This is something Henry Penwhistle is about to discover when he draws a mighty dragon...that runs away. Henry has a wild and crazy and wonderful imagination. He finds it hard to fit in at his school and meet the demands for conformity there. But he loves to draw and he draws a glorious chalk dragon on his door that makes its escape and heads for his school. Now Henry, his friend Oscar, and his whole school must face the consequences of Henry's imagination. Henry will learn very important lessons about chivalry, art, creation, and friendship in the process. I really enjoyed this book! I am outside of the target age zone, but I can easily see this being a delightful read aloud book as some reviews suggest. 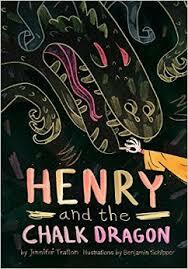 I love Henry's imagination, and how exciting everything is with it on the loose. It's such a fun concept and so...kid. But at the same time, the book addresses real issues about creativity and friendship that make it even more special. It's wild, adventurous and fun, has a sweet and gentle sense of humor, and when I finished I just felt a warm glow in my heart. Not all of the characters are who you think they are at first and there's a deep sense of generosity that hums in the bones of this story. But lest I go off on a tangent of how happy the heart of the book made me, the tale itself is clever, fresh and fun. More than anything, it's the kind of book that makes you feel generally better about things when you finish. The physical book itself is absolutely gorgeous, perhaps one of the nicer physical books I've held in awhile. There are some illustrations in the book as well, delightful drawings by Benjamin Schipper that add to the overall experience of the story.